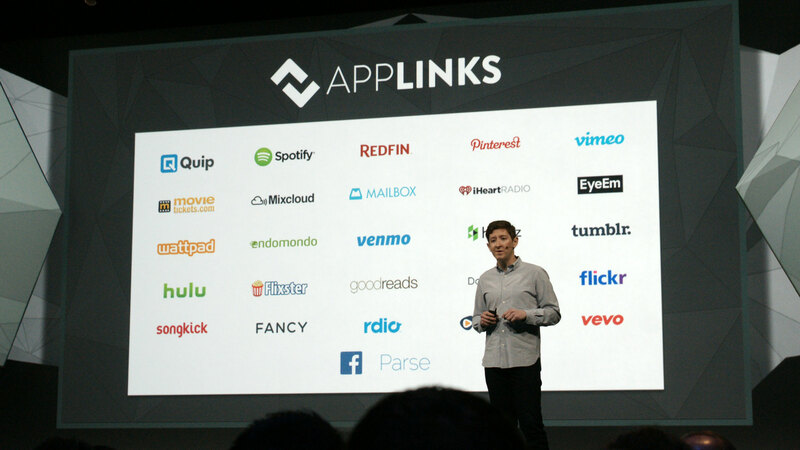 At its F8 conference today, Facebook announced AppLinks.org, a new way to link between mobile apps. Initial partners supporting the new technology include Quip, Spotify, Movietickets, Mixcloud, Redfin, Mailbox, Pinterest, iHeartradio, Vimeo, EyeEm, Wattpad, Endomondo, Venmo, Houzz, Tumblr, Hulu, Flixster, Goodreads, DailyMotion, Flickr, Songkick, Fancy, Rdio, Rhapsody, and Vevo. Our original post is below. With Facebook’s F8 conference almost upon us, a slew of interesting nuggets are sure to emerge from today’s event. But we’ve gotten wind of what one of these announcements is to be. According to a blog post (since pulled) from Songkick, Facebook is creating a new way of linking between apps on mobile devices, with a number of launch partners to be announced today. More details of the initiative will be available at AppLinks.org, which currently redirects to Facebook’s open-source virtual machine HHVM portal. While details are currently scant, it seems this open initiative will be all about creating a standard, smoother way of linking between native apps installed on the same device. For example, if you open Spotify on your iPhone and want to click through to a third-party service such as Songkick directly from within it, this will make the transition more seamless, bypassing the mobile browser version altogether. The Next Web is in the house at F8 today where we’ll be bringing you full details of this and other news as it’s announced, so be sure to follow all our coverage right here.